Congratulations! You've decided to join our wonderful IRC community! 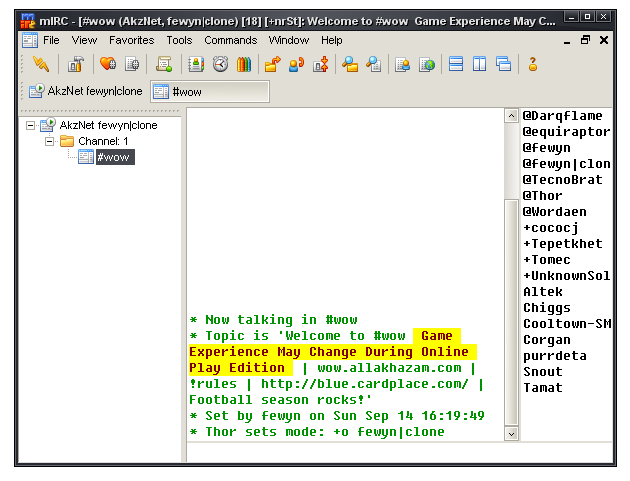 For those who have just happened to come upon this guide, IRC is a type of chat room that we use here at Allakhazam. This guide was written to allow for people who have never used IRC before to easily get connected. Currently it's Windows only and one for other platforms may be written sometime in the future (You can still connect and a similar principle can be used on Macs and Linux.) There are several software options you can use such as x-chat but mIRC will be used in this guide for it's ease of use. First step is to goto www.mirc.com and download it and install it. When you first open up mIRC you should get the options window if you don't click Tools and then Options. Now you should click Servers on the left and then click the Add button. 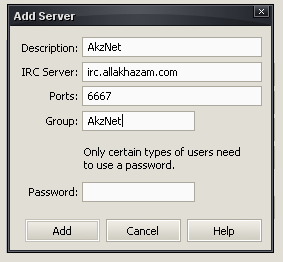 Fill in the Description (This can be anything but I chose AkzNet as that's the name of the server), IRC Server put irc.allakhazam.com there, Ports which is 6667, and Group (Once again AkzNet.) Our server does not have a password but if it did you'd enter it in the Password box. Now click Connect on the left and then click the Connect button. If this is the very first time joining IRC a window called "mIRC Favorites" will pop-up. I suggest unchecking Pop up favorites on connect and then clicking ok.
Now you are connected to IRC! We're almost done just a bit more to go! In the box at the bottom window type /join #wow and press enter on your keyboard. Now you may be wondering what all these symbols and stuff are for next to peoples names. They all have a purpose and I'll try to explain them here. People with an @ symbol next to their name are Operators. Those people are the ones who have power and run the channel. They can do everything from changing the topic to banning people from the channel. The + symbol next to their name are Premium users, this is just a small status symbol for users of premium as people with the + have no other power other than being able to talk while the channel is muted. These users are called voiced users or peons. Now one of the first few things you may want to do when you have joined the channel is type !rules this will display the rules for the channel. You normally will see a creature named Thor hiding out as an @ he is actually a bot. All he is there to do is help manage the channel and do automated things that the operators of #wow feel he should do. He can also tell you about the weather! By doing !w zip code he will tell you what the weather is like outside and doing !fc zip code will give you a 3 day forcast. All data gathered from Wunderground. This page last modified 2010-11-29 10:02:40.